We all need sleep. Come Winter or Summer, Spring or Autumn, nothing should keep us from getting our deeply needed Zs. Well, for Summer, Organic Hemp is our Secret Weapon! When come Summer, our magic bedding essential, is an Organic Hemp Duvet. It keeps you cool and dry all night, and keeps the heat from stressing you out, or waking you up. Basically, it will always have you covered – in the best possible way. The first time you try it, you’ll be wondering where it’s been all these years. Learn more about the magical benefits of organic hemp! Indeed, Organic Hemp is not only very kind to the environment, it can even absorb toxic metals, emitted by nuclear plants into the soil, such as copper, cadmium, lead and mercury. Organic hemp is also very helpful for summer sleep, being even more breathable than cotton. An organic hemp duvet, for instance, will keep you feeling cool and dry, all night long, despite the hot and sticky summer weather! Organic hemp bedding helps reduce heat stress, so you can get the sleep and the rest you need. Want to experience a cooler summer night? Wait no longer: discover the magic of organic hemp! Organic Hemp never “traps” in the heat or the moisture. Indeed, the main problem with synthetic or synthetic blends, is that they don’t breathe. Sleeping in breathable materials, is extremely important, because your body obviously needs to breathe! And knowing that we loose at least 300ml of body vapour per night – and even more so when it’s hot – you need bedding that will keep the air flowing, and the moisture away from your skin. Organic hemp performs miraculously in hot weather, and will keep you from experiencing stress while you sleep! Organic Hemp fibres, are actually very light. We card the hemp ourselves, to untangle the fibres and make them fluffy. This process is completely toxic-free, and uses no chemicals what so ever. 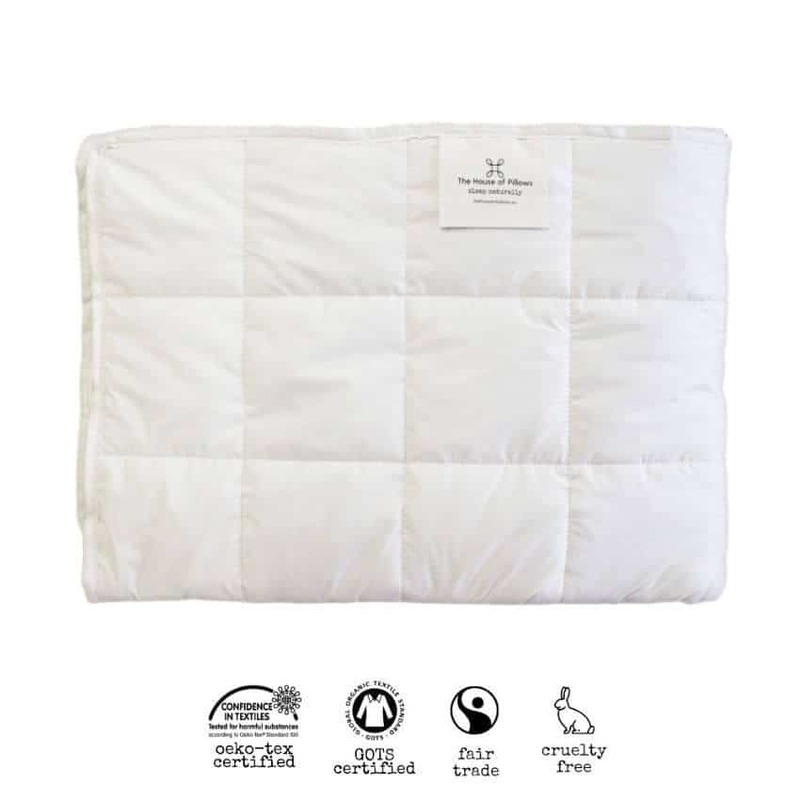 Our organic hemp duvets are light, and have a similar feel to a light organic wool duvet. For the summer, an organic hemp duvet will give you the coverage you like, without the heaviness and heat of conventional blankets and duvets. Organic Hemp goes above and beyond to keep the earth healthy. Hemp is a crop that’s naturally resistant to pests. It doesn’t need pesticides or herbicides, and even a very minimal amount of fertilizers are required. Because of hemp’s abundant leaves, which fall into the soil, they release the required nutrients and minerals. And this creates a very healthy soil for the plant, completely naturally. Hemp crops grow dense and vigorously. So, sunlight doesn’t penetrate the ground, and this create a weed-free crop. The roots of hemp plants go very deep, and hemp plants use ground water, and reduce its salinity. Whats more, top soil erosion is limited, thereby, reducing water pollution. The roots of the hemp actually improve soil, as it naturally transfers nitrogen and other nutrients into the soil. Also, hemp needs very little soil rotation, and the quality of the hemp doesn’t deteriorate. Hemp can even absorb toxic metals, emitted by nuclear plants into the soil, such as copper, cadmium, lead and mercury.